Bloggers Emin Milli and Adnan Hajizade celebrate their release after 17 months of imprisonment. This post is not about me. It's about two people, worth love and respect who had to go to prison. And came back. And their friends and close ones, who stayed on the other side and didn't give up. 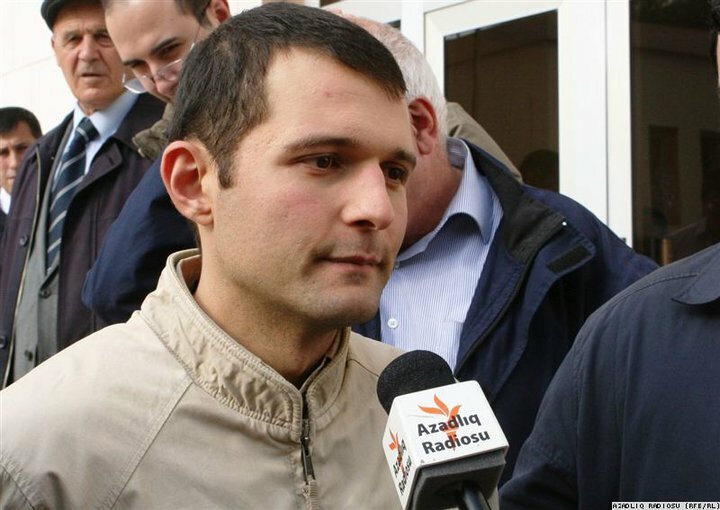 Emin Milli leaves the prison. Azerbaijani bloggers Emin Milli and Adnan Hajizade were arrested on July 8th, 2009 with the charge of hooliganism after being beaten by two athletic strangers in one of the downtown cafes. Evidences, such as street camera, which showed them, beaten, going to the police station to file complains, as well as many other evidences that could prove them innocent, were not accepted by the court. Testimonies that could help them, were not heard either. After four months of pre-trial detention, Emin Milli and Adnan Hajizade were plead guilty and sentenced 2,5 and 2 years of detention respectively. The night Emin Milli and Adnan Hajizade got arrested around 30 people were standing in front of the police station. It was only 30, because Emin asked us not to post any information, since they were promised to be released soon. Their friends were waiting outside the station the whole time, even after a group of policemen, pushed them on the road, saying they are not allowed to stand there, calling them a 'gang'. After 8 hours of waiting, Adnan called to say they are being arrested for 48 hours. The campaign, we called AdnanEmin, was probably the biggest of its kind in Azerbaijan. No one will be able to tell you how exactly it all started. It just did. The moment they were arrested, it was posted on Facebook, Twitter and Youtube. Then moved to blogs, Radio Liberty, then to Yahoo Groups, e-mails, Skypes, Youtube, local media, international media, international organizations (Amnesty International, Human Rights Watch, Freedom House, Reporters Without Borders and others) and NGOs, political parties and politicians. Then there were numerous statements (EU, CE, OSCE, US Department of State, UK Foreign Office, German Foreign Office and others), meetings, Emin and Adnan being included to agendas, Azerbaijani officials being asked about their case wherever they would go. Articles about them would be translated to countless number of languages, including Russian, English, Turkish, French, Spanish, Portugese, Macedonian, Hindu, Simplified and Traditional Chinese and many others. There was also the appeal of friends of Adnan and Emin to the President of Azerbaijan Ilham Aliyev , signed by hundreds of their supporters. Emin's and Adnan's court hearings would gather up to 100 people, sometimes more. Protest actions would be held in several cities of the world, including Paris, London and Washington DC. Emin's birthday in October 14th, 2009 would be celebrated in London, Paris, Strasbourg, Istanbul, Ankara, Budapest, New York, Houston, Moscow, Basel and several other cities. There were videos for Adnan's birthday on July 13th (4 days after their arrest). Adnan Hajizade being interviewed by RFE/RL after his release in the courtroom. "Now, it's only left for Obama to mention it", people would joke... And then, he did. This campaign was held by a group of friends and supporters of Emin and Adnan, and their friends all around the world. This campaign was held without any financial support. This campaign was mostly intuitive and absolutely sincere. It was so strong, that randompro-governmental or governmental voices would be left unnoticed. Emin Milli and Adnan Hajizade were released conditionally on November 18th and 19th, 2010. Today, they're home, with their families and friends. They are happy to breathe clean air, sleep in their beds and eat home made food. They say the conditions in prison were tolerable, detainees treated them with respect and guards did not use any violence on them. They have plenty of funny stories from prison and even more information they want to share with the world from almost 300 books they read there. And they are still not done reading and watching all the material about their campaign. On July 8th, before a group of policemen pushed us on the road away from the police station, the officer asked us who we were and why we were standing there. "We're their friends", was our response. "How many friends can a person have? ", officer cynically smiled. "Oh, you'll see", we thought. This post shouldn't be about me, but partly, it is. Because writing it makes me happy as never. Welcome home, Emin and Adnan!